Although bees are crucial to pollenating, they can be a significant danger when they set up hives close to your home or business. If you regularly see or hear bees at your location, chances are they are too close for comfort. 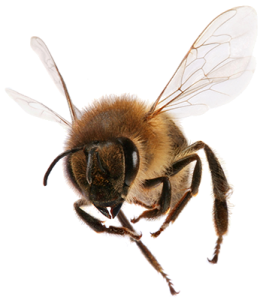 A bee pest control inspection from Arizona Organic Pest & Termite Control professionals is the first step to safeguarding your property and the people on it from a potentially harmful bee infestation. Signs to be concerned about bees nesting on your property are a fairly constant presents of bees flying in and out of openings on your house or other structure. You may also see this activity in trees, block walls or other structures on your property. Bees that have taken up permanent residence anywhere in your property or business require immediate attention. In addition to potentially fatal bee stings, bees often nest in inconvenient locations and can cause significant property damage. An entire hive is predisposed to fiercely attack when the nest is threatened. Do not attempt to manage or remove a bee or wasp nest on your own. Our licensed and trained pest management experts know exactly where to look to identify a bee colony that has invaded your home or commercial location and provide you with appropriate bee pest control service. To learn more about bee pest control and how to eliminate them safely, contact a Arizona Organic Pest & Termite Control specialist for a free assessment. These innocent looking pests usually nest on the ground but can be found near patios, decks, attics or beneath roof beams. They are capable of pursuing a perceived hive invader for long distances. Of all bee types, Bumblebee stings are the most painful and can cause extensive swelling.